Home A: News Water, water everywhere. Again. Thursday's flooding of the Brandywine as seen from the Lenape Bridge on Route 52 at the Pocopson-Birmingham border. The National Weather Service expects the Brandywine to crest sometime Thursday afternoon. If it seems like a bit of a deja vu experience, it’s because only little more than week after Hurricane Irene had its way with the Unionville area, the remnants of Tropical Storm Lee have dumped about five inches of rain on already soaked ground, once again flooding the Brandywine, closing roads, schools and various local businesses. The National Weather Service issued a Flood Warning for the Brandywine at Chadds Ford, with the creek expected to rise to 12.9 feet — a flood is considered 9.0 feet above normal. 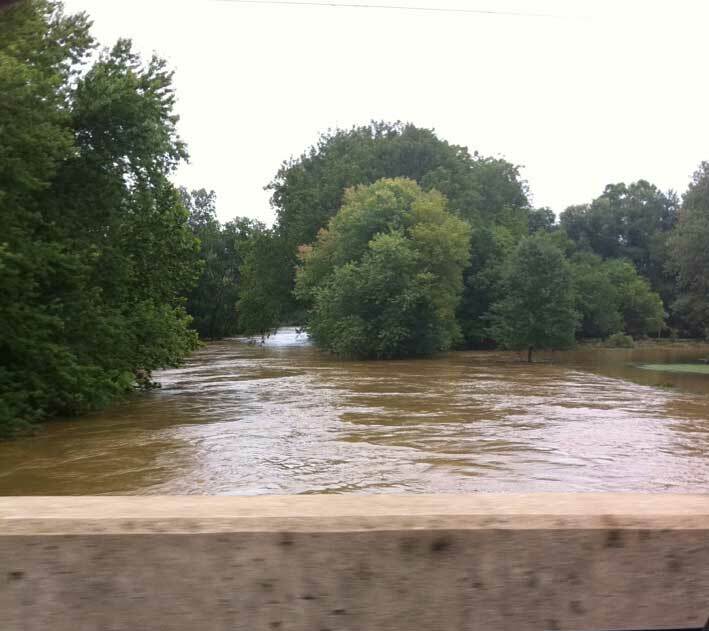 According to the NWS, typically, if the creek reaches a flood level of 13.0 feet, local homes in the immediate area of the Brandywine have to be evacuated. The Route 926 bridge over the Brandywine is again closed — it briefly reopened Wednesday afternoon, and based on the flood forecast may not be open again until Friday. After being forced to delay the opening of schools on Wednesday, worsening flooding caused school officials to first delay and then close schools on Thursday — already the second weather related closure of the young school year. There are some scattered reports of power outages, as a few trees toppled because of soft grounds, but nothing as widespread as was seen during Irene. We’ll have more on this today as events merit. If you have news, send it to mike@unionvilletimes.com.